In a world where the term “animated” has become equivalent with “computer animated” and “Digitally sterile, ” it is becoming increasingly hard to find films that are keeping the original spirit of animation alive by offering up a level of artistry that is more reminiscent of traditional painting than it is of computer science. “Song of the Sea” is such a film, a gem of a modern animated movie that is filled with vibrant visuals that are a far cry from the smooth computer geometry that we find in Hollywood’s animated mainfare these days. It is imaginative, rich, stunningly beautiful and truly reminds us of actual art. 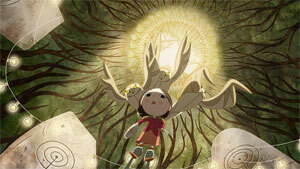 “Song of the Sea” tells the story of Ben, a young boy who is struggling with the recent death of his mother. In many ways he is blaming his baby sister Saoirse for her death and treats her accordingly. But their father is also struggling. A lighthouse keeper on a small island off the shore of Ireland, he is prone to dark moods and barely manages to keep up with the children, so he decides to send them to the mainland to live with their grandmother. But the children don’t like to stay in the city and go off on their own to find their way back home to the ocean, to where Saoirse belongs, because as Ben has just found out, she is a seal-child—just like their mother was. The last of the selkies, a race of mythical creatures, she has powers that Ben cannot explain, but it soon begins to attract the wrong kind of attention, and before they know it, Saoirse and Ben are tracked by the owl witch Macha, who wants Saoirse’s soul. 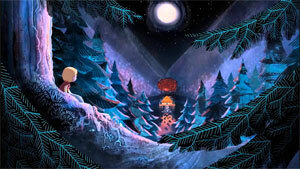 Entirely hand drawn, “Song of the Sea” is a truly magical experience. From the beautifully painted backgrounds to the creative environments and the imaginative plot points, the film reminds us constantly of the charm and unique signature that animated movies used to had. Since every animated movie these days seems to fall back on stock templates for their characters and looks and is rehashing the same old tropes over and again, it is truly refreshing to see something so uniquely different. Like the original “101 Dalmatians,” whose pencil and water color-style created a distinct look and flair at the time, “Song of the Sea” is constantly using artistic techniques and colors to create the vibrant world it plays in. Filled with mystical creatures and brimming with Celtic lore, you will undoubtedly fall in love with the film before you even know it. It is easy to forget that animated movies used to be a lot of hard work—that was before computers took over the toolchain and turned it into a purely industrial process, typically farmed out to China or Korea. In “Song of the Sea,” every single frame in the movie has been hand painted, and it shows. 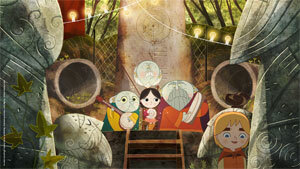 Without the help of computers to smooth out animations, without the software offering ease-in and ease-out crutches for scrolling and pans, this film carries a unique signature throughout. It is the stamp of the artists and animators, which ultimately breathes life into the film and its story, and I am not sure when the last time was I was able to say that. The film is also wonderfully cast with good voice actors who bring the characters to life in a way that is not loud and larger than life, as has become tradition in today’s animated Hollywood movies, but instead opts for subtle charisma and thoughtful dialogue. The characters all speak with a brogue, adding further to the flair of the film. To add to the visuals and the story, the film’s music is absolutely marvelous. A blend of modern music with strong traditional Celtic influences, it instantly transports viewers to the Emerald Isle without ever appearing tacky or old-fashioned. 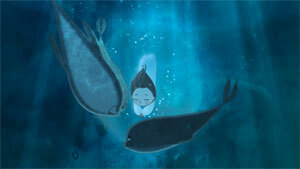 Universal’s release of “Song of the Sea” offers up a pristine 1080p high definition transfer of the movie. It is perfectly clean and does not exhibit even the slightest of flaws. With its rich hues, “Song of the Sea” renders an image that is awash in vibrant colors, making for a magnificent showing that fully emphasizes the artistic aspects of the film. A DTS 5.1 HD Master Audio track accompanies the movie, creating a wide and breathing sound field that is transparent and makes the most of the film enchanting sound track. Surround channels are used perfectly without ever being distracting or overly aggressive, while dialogues are well integrated and always remain understandable. Universal Home Entertainment has also added a few bonus features to the disc, such as a commentary track by director Tomm Moore, in which he discusses at length the ambitions behind the project and how he and his fellow filmmakers approached the project to create the stunning vision. He is quite evidently very proud of the film, and deservedly so, because just like that, it has become a new landmark in the animation industry, the kind of animated feature that more filmmakers should aspire to. 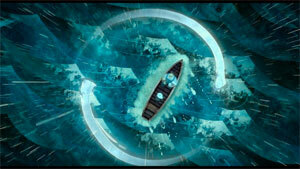 You will also find animation tests and a look at the artwork on the disc, along with a behind the scenes featurette. “Song of the Sea” revives the artistry that used to be animated movies, and is a stalwart example to show what the animation genre has lost. 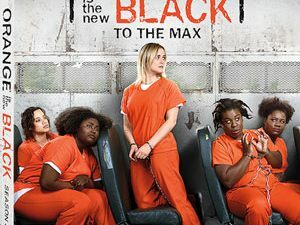 Just like the owls, stealing the souls of the selkies, turning them to stone, computers have turned animated movies into formulaic clones of themselves without true artistic aspiration, vocabulary or emotion. 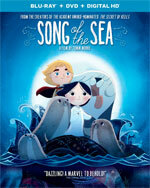 If you are a fan of animated films, “Song of the Sea” should go right at the top of your shopping list.